The first clubs were formed at St. John's under the second headmaster, Brother Norbert C.F.X. The first two clubs were based on national fraternities: Alpha Delta Phi and Kappa Kappa. The two clubs became "great rivals." 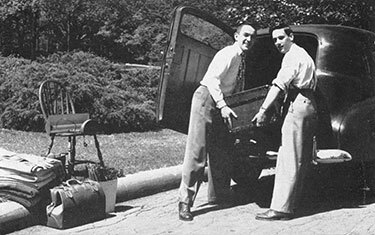 Sigma Nu formed in 1923 and became such a powerhouse that it hosted three club meeting rooms, a gym of its own, and a bowling alley in the basement of the Ryken dormitory building. After a run-in with the headmaster, Sigma Nu offered to buy the Administration Building. Brother Norbert also oversaw construction of our Gothic-style dining hall building. In 1926, Brother Edmund earned the distinction of being the first alumnus and former faculty member to become Headmaster of the school. His Brothers recognized his leadership skills and later appointed him President of Xaverian College. New extracurricular activities, fraternities, and scholastic societies carried St. John's up another rung on the ladder of success under headmaster Brother Ambrose 1929-34. He oversaw the development of our present football stadium, track, tennis courts, and enlargement of the library in the Administration Building. In 1930, the Sisters of the Divine Redeemer joined the staff to serve as dietitians and cooks for the students and Brothers. All German born, they were a remarkable group of women, who served at St. John's for twenty-one years. During World War II, students were allowed to graduate in three years plus one summer so that they might contribute to the war effort. This dramatically reduced the student body, so from 1944-47 seventh and eighth grade boys attended the school.